4th and 5th graders have a special place in our Kids1st Ministry--we call it Highway 45! We believe that God has a purpose for each child and a perfect plan for their life. We believe that ALL children can and should be provided the opportunity to learn about their Creator who made them and loves them more than they can imagine. You can be assured that your kids will learn that EVERY story in the Bible points to Jesus and that we were made for His glory! They will be taught to apply God's Word to their lives in simple ways that they can continue to build upon as they grow. We want to make FBC a place where your kiddos love to come! We have current background checks on file for all volunteers and staff. All children 1st-5th grades meet on the 2nd Floor of the Education building. We use a digital sign-in system for all children, which you can set up easily upon arrival in the Kids1st wing (watch this video to show you how to sign in). 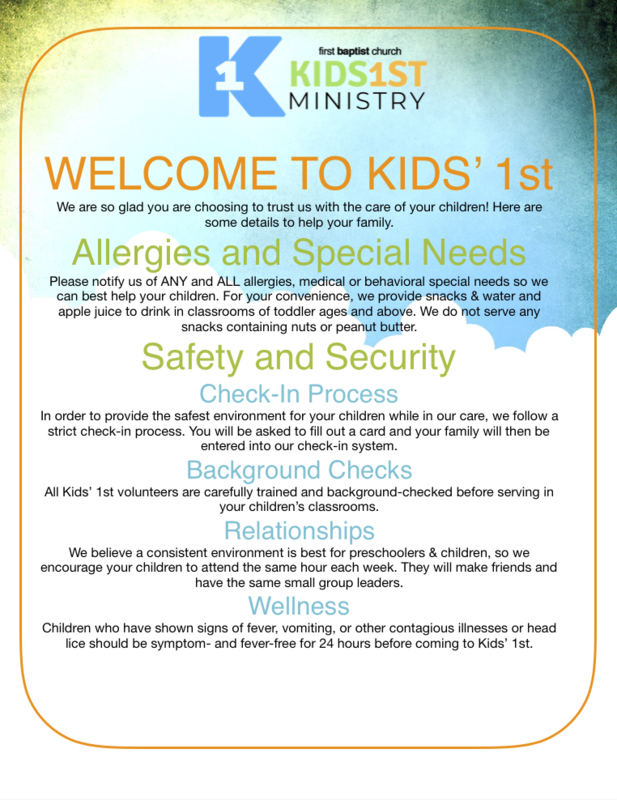 We take safety very seriously--click HERE to see our children's ministry policies and procedures. Sign in on the first floor of the Education Building. Drop off 4th through 5th graders on the second floor of the Education Building for Sunday School at 9:45 am. Children will be taught material from the Gospel Project by teachers who have been background-checked and love to teach about Jesus! Learn more about Sunday morning curriculum HERE. Pick up children at 10:45 am. Drop off 4th through 5th graders on the second floor of the Education Building for MidWeek at 6:15 pm. Children will be taught material from the Orange curriculum by teachers who have been background-checked and love to teach about Jesus! Learn more about MidWeek HERE. Pick up children at 7:30 pm. We often have Kids1st-specific events at church. We want YOU to be a part of our upcoming events. To see all Kids1st upcoming events, click HERE!